We are two Greek-Australians, working in the media and living in London, who fell in love with Croatia upon our first visit in 2005. We have visited each year since, to idyllic Istria, where stunning views, gorgeous hilltop towns like Motovun and Grozjnan, and great food (think truffles!!) and wine, offer a sensational, get-away-from-it all respite from hectic lifestyles. 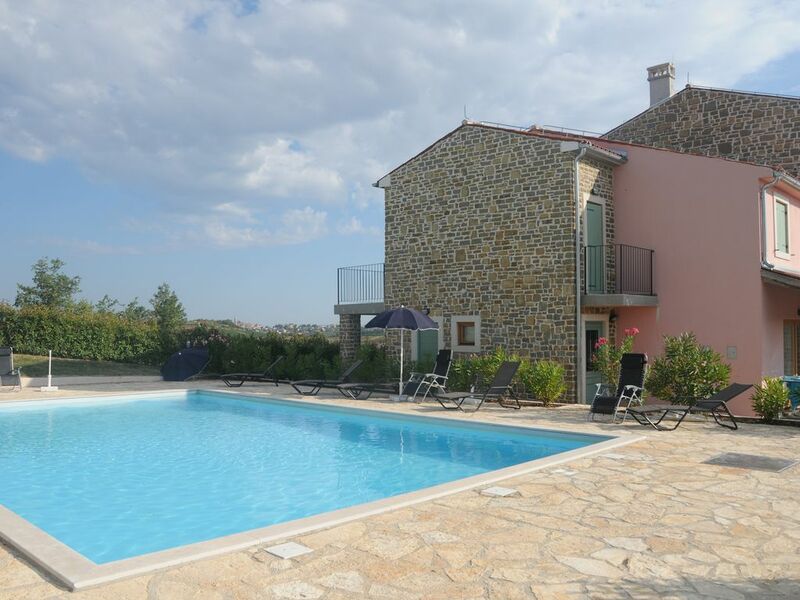 The villa is situated in a tiny village and offers tranquillity and privacy, with the ancient hilltop towns Motovun and Grozjnan just a few kilometres away. Even in the busy tourists months, the villa and its surroundings are away from the crowds, so you can move from vineyards to taverns and hilltop towns to the beach, peacefully and with ease. Fantastic views and high spec property in peaceful, rural location. Lovely shared large pool. Property even nicer than in photos. Peace + quiet. Fabulous views. Wonderful spacious apartment in beautiful setting. Lovely area. Kids loved pool. Property manager met us on arrival and was super helpful. Highly recommended. It's rare to find a villa with outlooks such as these, from practically all sides, front, back and with gorgeous hidden terraces upstairs. It is in a very peaceful location on the outskirts of a tiny village which is very picturesque. The pool is shared by 2 houses i.e. 6 properties but it is very large with plenty of loungers - most of the time only one other family in. It is a little "cool" as doesn't appear to be heated so bear that in mind if you have tiny children. Very freshing on a hot day though. The villa itself feels like it's pretty new, kitchens and bathrooms are high end. Beds are extremely comfy with good quality linen. The internal pictures online actually don't do it all justice. Aircon worked well ( have been in many properties where it's feeble!). Decor and furniture is very tasteful and comfortable although we ate most meals outside on the terrace - why wouldn't you! Ivona the property agent was really helpful. In short, we are very sad to leave and would come back in a heartbeat. Thank you so much and it's great to read that you and your family had a wonderful time. We hope to welcome you back next Summer!! Take care. Joli duplex, fournitures de qualité, très confortables et avec différentes terrasses donnant sur de beaux paysages. Mention spéciale pour la suite parentale avec sdb et terrasse avec petite table et chaises, vue bucolique avec la mer au loin. La localisation n'est pas mal mais il faut toujours utiliser la voiture, rien dans les environs (min. 10-15 ' pour le premier magasin, resto...). We really enjoyed our vacation in Baredine. The villa is equipped with full confort and very clean. It is well situated in a peaceful street at some minutes or Buje village. villa achilles is beautifully designed and very high spec..
Baredine is a small, quiet village, making this an ideal location for a relaxing holiday with family or friends. There is a shared pool, with sun loungers, but it is never busy or crowded as most people go on day trips/drives. The coast is a 20-minute drive away, and inland there are many ancient hilltop villages, like beautiful Motovun and Grozjnan, to explore in the beautiful Istrian countryside. The price is inclusive of: bed linen, towels, fully equipped kitchen (coffee machine, microwave), water, arrival cleaning, air conditioning, tax and registration.